Manage your finances your way with TruWest’s new online budgeting tool, Money Management. This free interactive dashboard brings together all of your accounts, loans and investments to give you a comprehensive picture of your financial journey. Quickly identify where you are overspending. 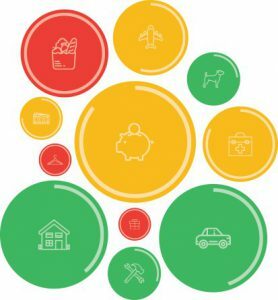 Red bubbles indicate you are over budget, yellow bubbles mean you are approaching your spending limit and green bubbles are well within your limit. Prioritize budgets in need of more immediate attention. Budgets with greater values are represented as larger bubbles, allowing you to focus your attention rather than poring over every detail. Compare your total budget with projected income. View the total amount you have budgeted, as well as how much you have left over to put toward your savings, debt and retirement goals. Money Management is available both online and through the TruWest mobile app, so you can access your accounts, transactions, spending and budgets wherever and whenever you want. How does Money Management differ from FinanceWorks? Money Management will provide the same in-depth overview of your spending trends as FinanceWorks does, with added features and benefits. These include more accurate auto-categorization of your transactions, requiring less work on your part, as well as more sophisticated goal setting, a personalized debt payoff calculator, access from the mobile app and more. Did my data from FinanceWorks transfer over to Money Management? Some data, such as your transaction history from your TruWest accounts, are imported automatically. Outside accounts will need to be re-added by entering your login credentials from your other financial institutions. From there, your transaction histories will be auto-populated directly from those accounts. Customized categories, alerts and goals will need to be re-added as well. How do I add an account or loan to Money Management? Under the Accounts tab, click the Add an Account button in the top right corner. Enter in the name of the financial institution. Enter in your login information for that account, loan or credit card. From there, your transactions should automatically populate into your budgets. Under the Transactions tab, simply click the transaction you wish to edit. From there, you can change the name of the payee and choose the desired category. You can even add your own subcategories by click on the plus sign next to a specific category, then selecting Add a Subcategory. How do I change the budget for a particular category? Under the Budgets tab, click on the bubble you wish to update. From there, you can click the pencil icon to edit the amount set toward this budget. Once you’ve changed the amount, click Save. Can I add a category to my Bubble Budgets? Yes! Under the Budgets tab, click Manage Budgets in the top right corner. Scroll down to the categories Not in Use, and simply click the category you want to add. From there, you can click on the new bubble and select the pencil icon to set an amount for your budget. Any transactions classified under this category will automatically populate into the amount spent.